Deposit £150 to be paid upon booking with the balance to be paid in full 8 weeks before arrival. 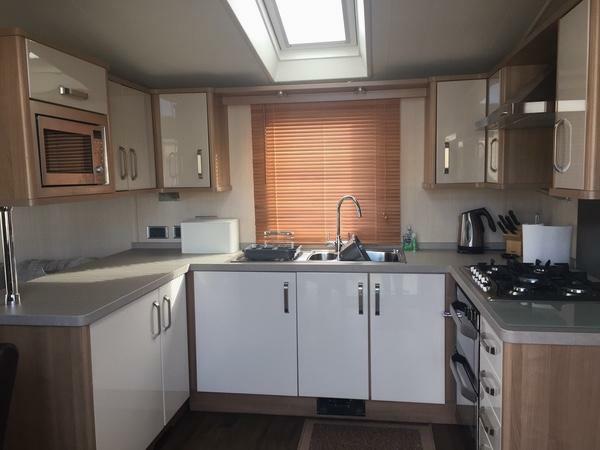 A 2013 Model 39 x 12ft Swift Chamonix Caravan located on a large pitch in Bay View with sea views onto Caldey Island. There is a large comfortable living area with wall mounted fire and central heating, making it ideal for use all year around. There is also free standing 3 piece suite, fitted furniture and a flat screen TV with built in Freeview and DVD. Patio doors lead onto the wide decking area. There is a fully fitted modern kitchen with gas cooker with a 5 ring hob, integrated fridge & freezer, kettle, toaster and microwave. There is also a dining table with 4 chairs. The master bedroom comes with a king-sized bed and en-suite toilet, there are also fitted wardrobes and a dressing table. Pillows & Duvets provided but you must supply linen. 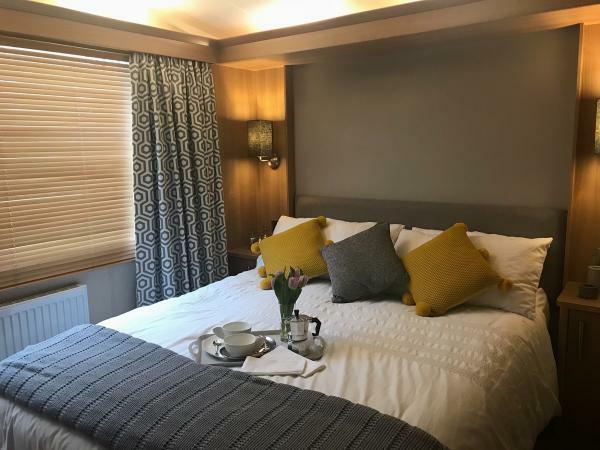 The second bedroom is fitted with two single beds (that can also be pushed together to make a double) and ample cupboards and storage space is available. Pillows & Duvets provided but you must supply linen. The main bathroom comprises of a large shower cubicle, sink with storage unit and a w/c. Externally there is a private parking area for up to 2 cars and a sea view decking area with patio furniture & BBQ to make the most of the stunning sea views. First time staying here for my husbands birthday surprise, the caravan looked lovely from the outside and was not disappointed when we walked in, Kelly was perfect host, lovely homely feel in the living area and quite surprised at size of the bedroom, stunning views towards caldy lucky the weather was amazing didnt need to go anywhere we are from pembrokeshire so just put our feet up in a relaxing friendly home. I would have added a plus to all my scores if it were possible . A beautifully clean well furnished modern van in an absolutely stunning location . Kelly was quick to respond to any queries I had before we went and I look forward to visiting again . Absolutely perfect ???? Spent a lovely relaxing weekend here in September.caravan spotless,views fantastic and customer sevice brilliant.kelly went above and beyond to ensure we had a wonderful stay.will definitely be booking again. Beautiful caravan with amazing views. We were so lucky to have found this caravan it has everything you need for a perfect holiday and more. Kelly the owner made the booking process so easy and stress free and also kept in contact with us as promised. We would also like to thank you for the lovely welcome gift and not to mention all your help and going out of your way to help us locate our forgotten iPad which my 6 year old hid in the bedroom. We highly recommend this caravan it really does have the wow factor. We are already looking at booking for next July to stay in this beautiful caravan. Kelly was really helpful and made booking the holiday easy and recommended places to visit during our holiday. The caravan was clean and spacious and the view from the decking is amazing! Would highly recommend to anyone. We had an amazing time and are planning next years visit already! Fantastic caravan, lovely and clean with everything you need, fantastic view and great location. Great communication from Kelly the owner from the start of the booking to the end even through the holidays recommending places to go. This if our first time staying at Lydstep Beach. 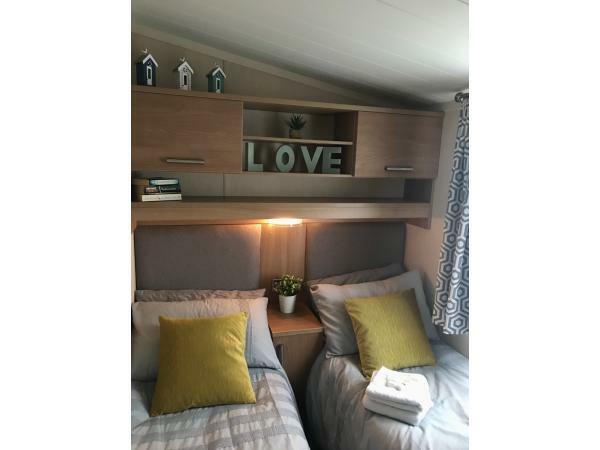 Booking the caravan was so easy and the owners couldn't be more helpful.The caravan was absolutely fantastic, comfortable, clean and very well equipped.it certainly has the Wow factor. it has everything you would need for a family holiday. I would recommend this caravan to anyone. We had a very lovely weekend and have already booked it for later in the year. Thank you Claire for you lovely comments, I'm so glad you enjoy your stay in our caravan.